The days leading up to the 109th running of the Belmont Stakes on June 11, 1977, were ominous. Belmont Park, which rests on the border of Nassau County and New York City's borough of Queens, was peppered with torrential rains, chilly, windswept conditions, and shrouds of fog. By the time the gates opened for the start of the historic race, the nickname for Belmont Park's main track, "Big Sandy," had unofficially been changed to "Big Muddy." The condition of the track was another hurdle in the ever-mounting list of obstacles that Seattle Slew would have to conquer in order to reach immortality. There is a feeling among horsemen that the "Racing Gods" will confirm the worthiness of a horse before they allow the completion of a monumental achievement. In light of the fact that the undefeated colt was attempting to achieve what no other horse ever had, the "Racing Gods" requested the assistance of Mother Nature, who promptly decided she had better make sure Seattle Slew was worthy. Trainer Billy Turner began Slew's preparation for the mile and a half race with a routine of long, leisurely gallops. The slow gallops, some three or four miles in length, were intended to take an edge off his speed and enhance his endurance. But a monkey wrench was thrown into the works when the pari-mutuel clerks working for the NYRA went on strike. Seattle Slew's exercise rider, Mike Kennedy, was employed as a pari-mutuel clerk in the afternoons. This meant that he, as a member of the striking union, was not allowed to set foot on a NYRA track. The replacement for Kennedy had an extremely difficult time handling Slew. The intimidating colt "ran off" with him and was circling the track at will. He had to be reigned in by outriders. Slew's reaction to Kennedy's absence highlighted his intelligence and iron will. However, the situation was unacceptable for a colt training for a 12 furlong run into history. Seattle Slew and Kennedy shared a magical rapport. From the beginning, Slew seemed to accept his gentle but assertive guidance. Gaining Slew's acceptance was nearly all of the battle for those fortunate enough to spend time in his presence. Kennedy's strength and manner of interacting with Slew clearly distinguish him as one of the finest exercise riders to have graced the American turf. Getting this team back together was imperative, and, thankfully, the strike was settled before drastic measures were necessary. Slew had his first serious workout for the Belmont nine days before the race on a fog-shrouded morning. He worked a mile in 1:38 2/5, prompting Turner to declare, "Knock on wood, the horse is doing fine. No Problems." On Tuesday morning, June 7, Slew and jockey Jean Cruguet jetted through six furlongs in 1:11 3/5. It was a move that was a full three seconds quicker than that of any other horse at that distance, and Slew did it with eye-catching ease. Kennedy was back aboard Slew for a three-furlong blowout move in :35 4/5 the day before the race. The Daily Racing Form noted that the going was sloppy and "Seattle Slew was hard held." Smiley Adams had Run Dusty Run back again for another try. The Dust Commander colt was highly impressive in his blowout work the day before the race. He went three furlongs in :34 4/5 on the sloppy strip and the Daily Racing Form noted that he "was at home in the going." Other Belmont starters that had already competed against Slew in a prior classic were Iron Constitution, Senhedrin, and Sir Sir. Make Amends, Mr. Red Wing, and Spirit Level were newcomers. "I don't think there are any heroes left, are there?" ventured John Russell, trainer for the Phipps family. "I think they'll ignore Slew and go for second place." Mrs. Penny Ringquist owned Spirit Level, a winner of his last three starts, including the Peter Pan Stakes just ten days earlier. Four years earlier, as Mrs. Penny Tweedy, she had directed Secretariat to his Triple Crown victory and was quoted as being "hopeful" to score an upset in this year's renewal of the Belmont Stakes. Years later, Turner explained that many of the critics that still doubted Seattle Slew were "jealous that Slew had come along just four years later and had rolled up a better record than Secretariat. He was a threat to his stature." Some of those doubting critics began to grasp at the proverbial final straw. They took to wondering if Seattle Slew would approach Secretariat's Belmont Stakes record for the mile and a half, knowing full well that the quagmire of mud would certainly assure that it would not happen. Indeed, the 1977 muddy Belmont surface would prove to be one of the heaviest surfaces ever encountered in Belmont Stakes history. Conversely, the 1973 surface that Secretariat set his record over was without a doubt the hardest and fastest strip in Belmont Stakes history. The proof is in the pudding, and Secretariat's was one of eight main track records set at Belmont in the spring and summer of 1973. No less than five of those records were set between May 19 and June 9 of 1973. Browsing June 11, 1977's Daily Racing Form, we see that seven of those eight main track records from 1973 still existed some four years later. Those statistics are an amazing indication of the speed of the surface that season. The track variant, used as a tool in handicapping to estimate the speed of the racing surface over a full card of races, was recorded as '05' on Secretariat's Belmont day of June 9, 1973. On the scale, a track variant number that is close to zero is representative of a very fast racing surface. There are few, if any, historical track variants as low as '05'. Seattle Slew's connections were always conservative with regard to going for track records, directing their concern to the conservation and well being of their Champion. This is evidenced by Cruguet's restraint of Slew during the early part of races and his easing of Slew during stretch runs. At the time, Cruguet commented on the matter of winning by large margins. "If a jockey in Europe wins by more than three or four lengths, he's considered a bad rider. You have to think of the handicap races, where lengths mean extra pounds," said Cruguet. On the morning of the race Turner noticed something slightly different about Slew. "I've never seen him so determined," he said. Slew was to gallop around the huge, mile and a half Belmont track that had been his headquarters for most of his career, but Kennedy pulled him up after only a half-mile. "He was afraid he could not hold him," Turner explained. "I had warned the outriders, too. This horse might have gone around two or three times." Turner had done an outstanding job of training Seattle Slew and was a good horseman. On the afternoon of the Belmont Stakes, however, Turner had retreated to Esposito's Tavern, located across the street from the Belmont Park stable area. He spent the afternoon with several friends including his drinking buddy Frank Tours, a backstretch liaison for the New York Racing Association. The problem was, he didn't leave. Everybody was waiting anxiously in the paddock but when the other horses arrived for the Belmont Stakes, Seattle Slew did not. The second call for horses by the racing officials prompted Mike Kennedy to search for Turner. He found him in Esposito's and Turner's reaction to the feeling of alarmed urgency was, "You don't think they're going to start the race without us, do you?" To make matters worse, the entourage had to attempt to move Slew to the paddock at a quicker pace than normal. Slew decided to stop several times and arrive at the paddock on his own terms. Post time was pushed back at least ten minutes, and the network went over their allotted time in order to stay with the coverage. At a hearing several days later, the racing stewards did not accept the explanation that the crowded parking lot caused Seattle Slew to take a longer way than usual. They fined Turner $200. When Slew finally arrived in the paddock, no time was wasted in tacking him up and getting him into the parade. He was very much keyed up, and there is a beautiful visual representation of this caught on videotape. As soon as Cruguet is given a "leg up" by Turner, Seattle Slew breaks into his "War Dance," really dancing and prancing sideways, and champing at the bit. In its June 20, 1977 edition, The Blood-Horse wrote, "Seattle Slew is an intimidating force, probably to other horses as well as to people. By the time of the Belmont, his opposition was cowed." On June 14, 2003, Mickey Taylor recalled his and Karen's concerns prior to the race. "We were concerned about the mud," he said. "Slew had never raced over a muddy surface and never really even trained over it. The works he put in prior to the race were really over slop, and slop is different than mud. Also, because all the prior races that day ranged from six furlongs to a mile and an eighth, the track from the starting gate through the first turn had not been raced over. Run Dusty Run's trainer, Smiley Adams, told me there were five to six inches of mud around the first turn. Slew handled that beautifully. Another point of concern was starting at the finish line of the mile and a half oval directly in front of the huge, screaming crowd. We all know that Slew was such a bundle of energy, and we were concerned that the crowd would have him more keyed up. Jean Cruguet was terrified of it, knowing how powerful Slew was." When the gates opened, Slew took the lead and angled over to the rail. Spirit Level moved to his outside, tracking him closely. Along the backstretch Run Dusty Run, with Sandy Hawley aboard, made a bold move, trying to take the lead from Slew. He moved between Seattle Slew and Spirit Level, who also put in his run to try to get the lead. 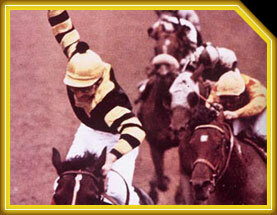 Seattle Slew reacted to this by simply "letting out" just a little to gain a length advantage again. Six furlongs in 1:14 was a joke for Seattle Slew, even in that mud. It was as slow as he could be conned into running, if you're of the opinion that Cruguet was doing the conning. But I have a different take on the matter. In retrospect, and after getting to experience Seattle Slew's incredible intelligence on a personal level, I believe he was just toying with the field. He simply relaxed on his own accord and played cat and mouse with his challengers. In a matter of a few strides on the far turn, Slew exploded away from the field. He opened at least four lengths, for good measure. Run Dusty Run and Sanhedrin tried as hard as they could but simply could not make up any ground. Run Dusty Run deserves special mention for falling behind Sanhedrin and then coming back again to pass him in the stretch showing his courage in an all-out effort. He was a wonderful racehorse that would've made a lot of noise had he been fortunate enough to not have to face Seattle Slew in the classics. Slew completed the race in 2:29 3/5. In a bizarre gesture, Cruguet stood up in the stirrups several strides from the wire and waved his whip triumphantly over his head. While it made for great theater, it was a foolish thing to do. Falling off would have cost Slew the race and the Triple Crown. Said Turner, "I'm just glad he didn't fall off. I've seen other jocks do that and fall off." "We knew this wasn't a track for record breaking," said Turner afterwards. "He does what he has to do. If something presses him it's like the first race of this year, when he destroyed the track record (seven furlongs at Hialeah), but it's hard to find a horse to press him." In the aftermath, Hall of Fame trainer Woody Stephens commented, "I've liked him ever since the Champagne last year, when he was good enough to run a mile in 1:34 2/5. I thought he was just outstanding, and I thought he would win the Triple Crown all along." That he did, with icing on the cake. In all the years before him and after him, no other horse has achieved what Slew completed on this overcast day at beautiful Belmont Park. He still stands alone as the only undefeated Triple Crown winner in the history of the American Turf.